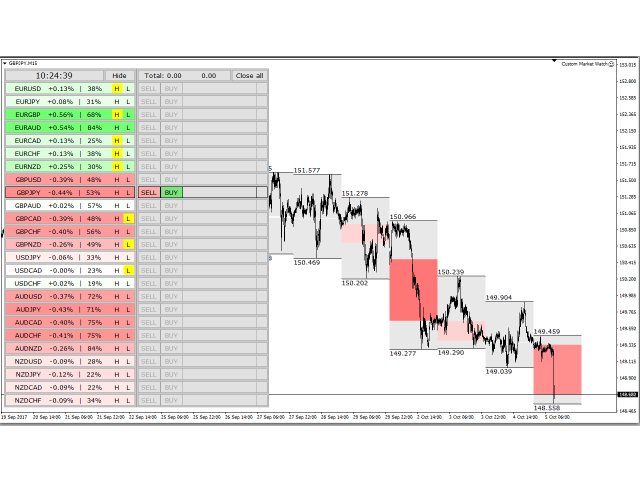 The Custom Market Watch (CMW) is a professional grade trading application which allows you to operate effortlessly with large number of symbols and multiple open positions simultaneously from one chart. The Custom Market Watch shows the most essential daily technical information for each symbol in combination with very simple and easy to use trading interface where you can monitor the net exposure for each symbol and you can open and close positions with one click. The app is automatically synchronized with the standard Market Watch window in MetaTrader 4 where you can set custom list with symbols in any specific order. Interactive list - cells in the list are colored with different intensity depending on the daily % change for each symbol. Also, with one click on each cell you can switch the symbol on the chart. Essential daily information - daily percent change and daily range shown as percentage of the average range for the last 20 days. 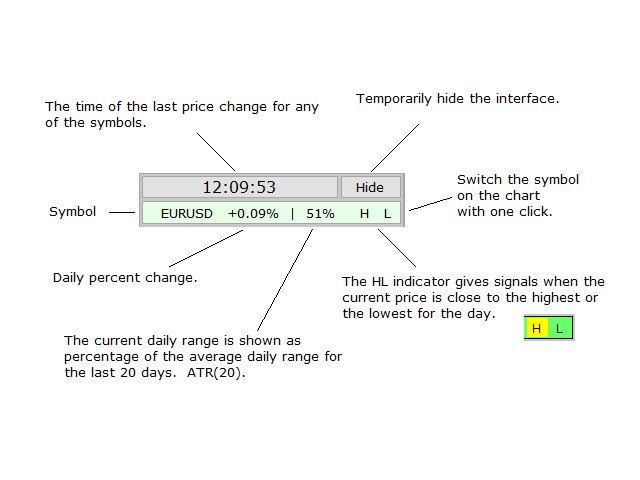 H L indicator - give signals when the current price is close to the highest or the lowest for the day. 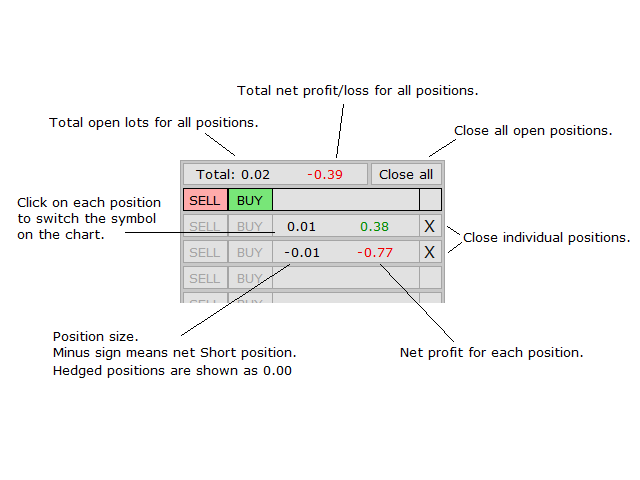 Trading interface - simple buttons for trading with one click plus basic position information including position size and net P/L. 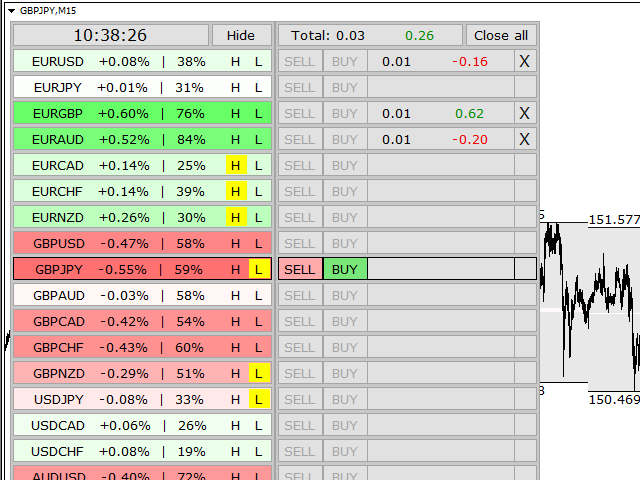 Simple risk control - you can set automatic Stop Loss and Take Profit for each market order. Also, you can set automatic trailing SL and TP. 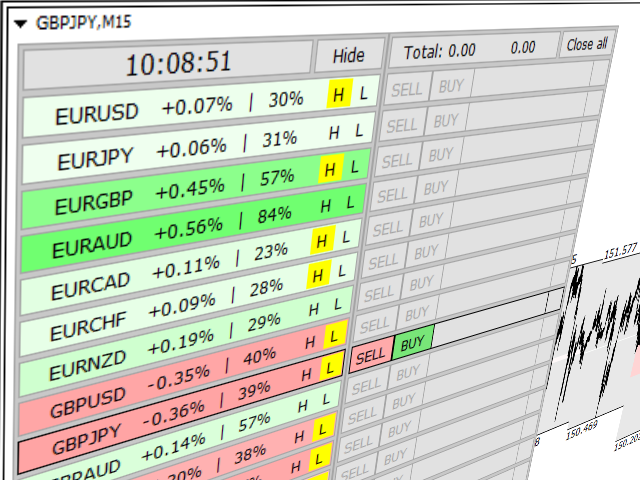 Transparent daily candles - color of the candles matches the percent change in the list with symbols. Projected ATR levels - levels are projected directly on the chart. Test mode - use this app as simulator for manual trading in the strategy tester. Alerts - you can set percent change levels to get automatic alerts. Test_Mode - prepare the app for trading in the tester. Number_of_Symbols - number of symbols in the list. 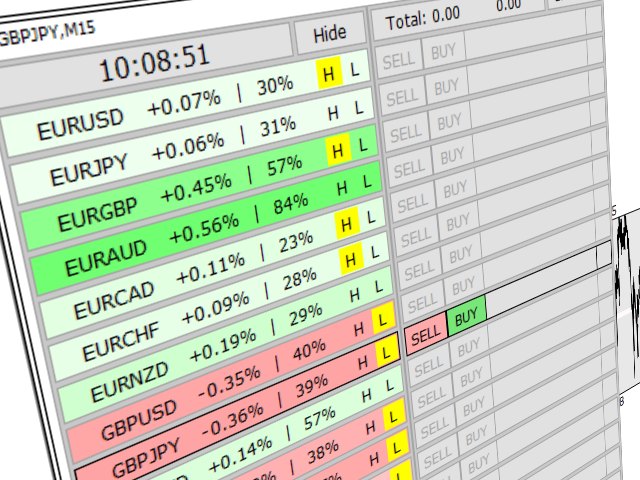 The list is synchronized with the standard Market Watch window in MetaTrader 4. Show_Trading_Panel - show or hide the panel. Show_Background_Candles - show or hide the candles. Number_of_Candles - number of daily candles on the chart. Candle_Tails - color for the "tails". Show_Candle_HL_Text - hide or show the prices. HL_Text_Color - color for the prices. 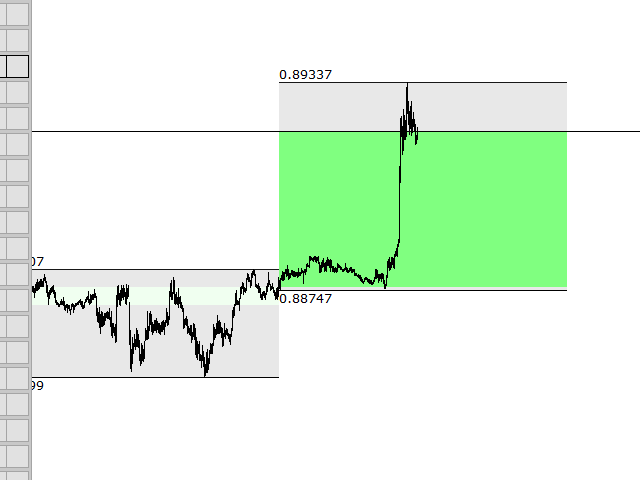 Show_ATR_Levels - hide or show the projected ATR levels on the chart. UI_Size_Multiplier - increase or decrease the size of the interface. Font_Size_Multiplier - increase or decrease the size of the font. X_Distance - horizontal distance from the upper left corner of the chart. Y _Distance - vertical distance from the upper left corner of the chart. 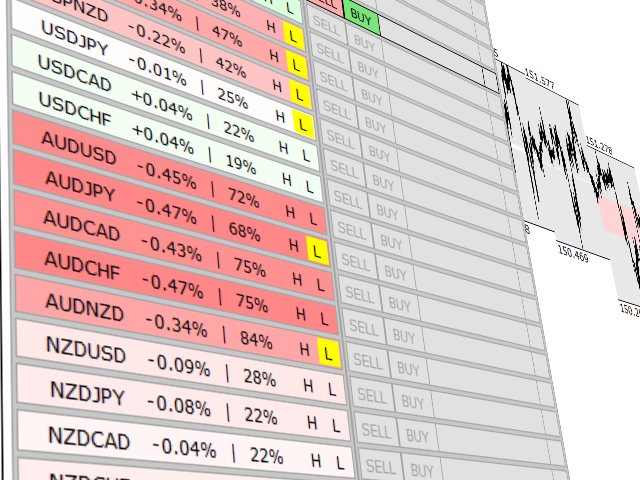 Chart_Auto_Set - set the colors of the chart automatically. Alerts_for_ALL_Symbols - set to false if you want alerts only for the selected symbol on the chart. Alert_Percent_Above_Zero - daily percent change level. Alert_Percent_Below_Zero - daily percent change level. Send_Notifications - enable/disable the mobile notifications. Magic_Number - magic number for all market orders. 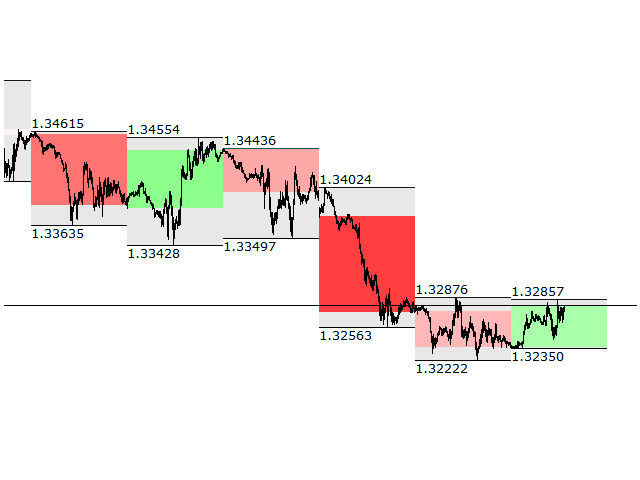 Stop_Loss - value in standard FX pips or in ATR points. Set to 0 (zero) to disable. 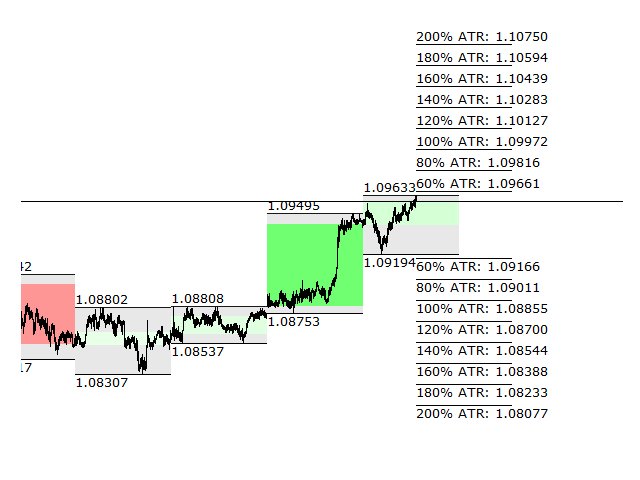 Take_Profit - value in standard FX pips or in ATR points. Set to 0 (zero) to disable. INFO - 1 ATR point = 1% of the average daily range for the last 20 days (atr_point=D1 ATR(20)/100). Note! The demo is not fully functional due to technical limitations in the tester - you can test the interface with only one symbol. If you have some questions, or if you need help - contact me via PM. Very good product! Congratulations! Would definitely recommend! It was a better product with the latest update! Fixed bug in chart objects.